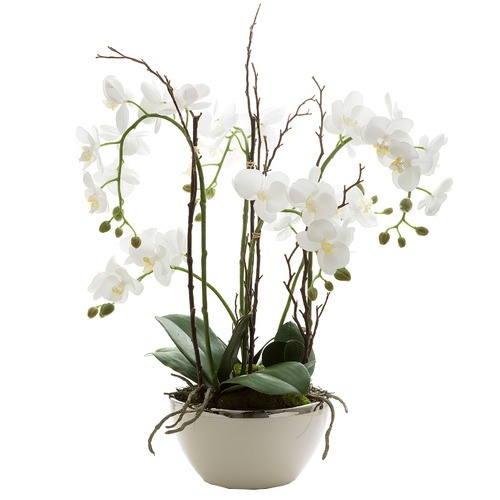 When you buy a 60cm White Real Touch Orchid with Pot online from Temple & Webster in Australia, we make it as easy as possible for you to find out when your product will be delivered to your home in Melbourne, Sydney or any major city. You can check on a delivery estimate for the Florabelle Part #: O152W here. If you have any questions about your purchase or any other Artificial Plants & Flowers product for sale our customer service representatives are available to help.Whether you just want to buy a 60cm White Real Touch Orchid with Pot or shop for your entire home, Temple & Webster has a zillion things home. Very happy with my purchase, this Real Touch Orchid is beautiful and exactly what I have been looking for. Price was very competitive as I have seen others that are not as lovely as this one and are more expensive. We have this plant in the foyer of our business, everyone asks if it is real! People don't believe me when I tell them it's fake!! I purchased for my new kitchen, arrived beautifully packed and was exactly what I’d been looking for. I’m so glad I purchased this quality item that was exactly as described. So Happy. A stunning piece that has added wow factor to the living room of my new house.